All admirers of the fastest and powerful cars looked forward to emergence of Ferrari 599 GTO. This model from one of the most prestigious producers instantly won success and popularity. The new car became the real exclusive masterpiece in the world of modern automotive industry. Numerous additional elements – a new frontal spoiler of unique design, a scarcely noticeable additional spoiler on a roof, three partial diffuser and side a channel became the main distinctive features of appearance of Ferrari 599 GTO 2011. Besides the new model received exclusive rims which were made in Germany. It is also worth noting that Ferrari 599 GTO differs in quite essential decrease in weight, the model weighs 83 kilograms less than the predecessor. It was reached thanks to the innovation use of a coal plastic, thinner mirrors, glasses and panels. 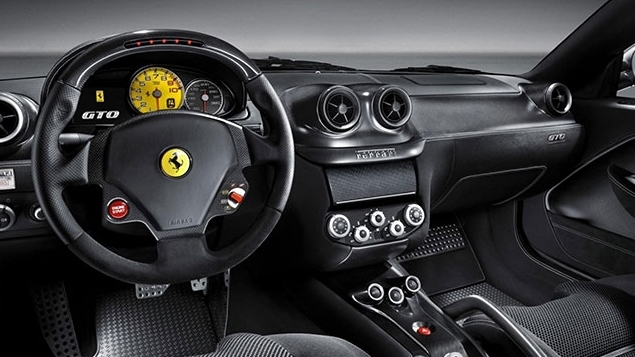 The main thing a distinctive feature of Ferrari 599 GTO salon is absolutely new central console. The car is equipped with a huge number of the special programs created for the help to drivers in management. One of novelties – the program reacting to the slightest changes of a road carpet and conditions of a driving of Virtual Race Engineer. Generally interior design of Ferrari 599 GTO is very approached to model – Ferrari California. There is no Spartan minimalism, but also excesses also does not meet. The driver’s interface of new model is improved to such an extent that the maximum comfort at interaction of the driver with the car is reached. The main distinctive moment – the maximum review the driver of all indicators of electronic control of Ferrari 599 GTO. 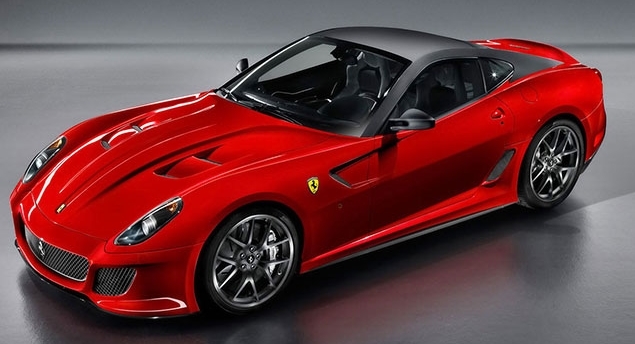 The main pride of Ferrari 599 GTO is the upgraded V12 engine which volume makes 6.0 liters. The main changes happened to an engine mount – the model received the back antiroll bar and more rigid springs. In the field of a brake system there were some additions – Carbon ceramic disks to ventilating cuts for increase of efficiency of dispersion of a hot air. Due to this reception dynamics of brakes improves and considerably aerodynamic resistance decreases. And engineers completely reviewed the available option of algorithm of operation of the available shock-absorbers. From 0 to 100: 3.3 sec. The main achievement of engineers at creation of Ferrari 599 GTO – increase in pressing force of the car without reduction of coefficient of aerodynamic resistance. It was reached thanks to absolutely flat bottom of new model and use of a huge number of aerodynamic elements. Ferrari 599 GTO received special pads on the thresholds, additional spoilers located on all body of the car. Besides the mass of the body considerably decreased thanks to replacement of some materials. Engineers, for example, gave special preference to Carbon and aluminum. The exhaust system of the car is also improved. There were sports collectors and two catalysts of sports type. The idea of the producer allowed to increase the power of Ferrari 599 GTO by 53 h.p. However, the similar mechanism equipped not all models for this reason the price of this model differs depending on an additional complete set. 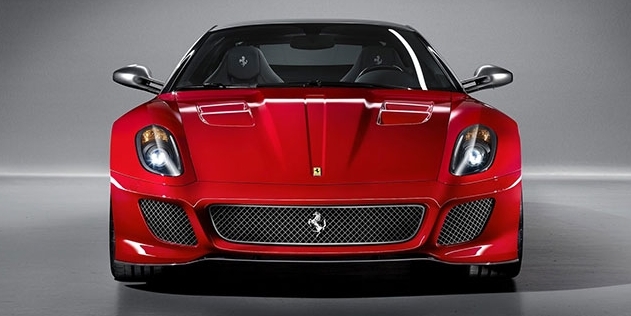 Ferrari 599 GTO is an exclusive model, all 599 copies of this supercar are let out. The cost of each car reaches 320 000 euros. However, in the Ferrari 599 GTO market most often appears with the cost of 426 000 euros. And the cost of the car can depend also on a model exclusivity. Some copies are equipped with additional expensive elements. A striking example in this case – exclusive final part of an exhaust system which has own cost from 6 000 euros.